245 Glendonnwyne Rd., originally 320 Quebec Ave. in background,home of Charles M. Hall, artist. 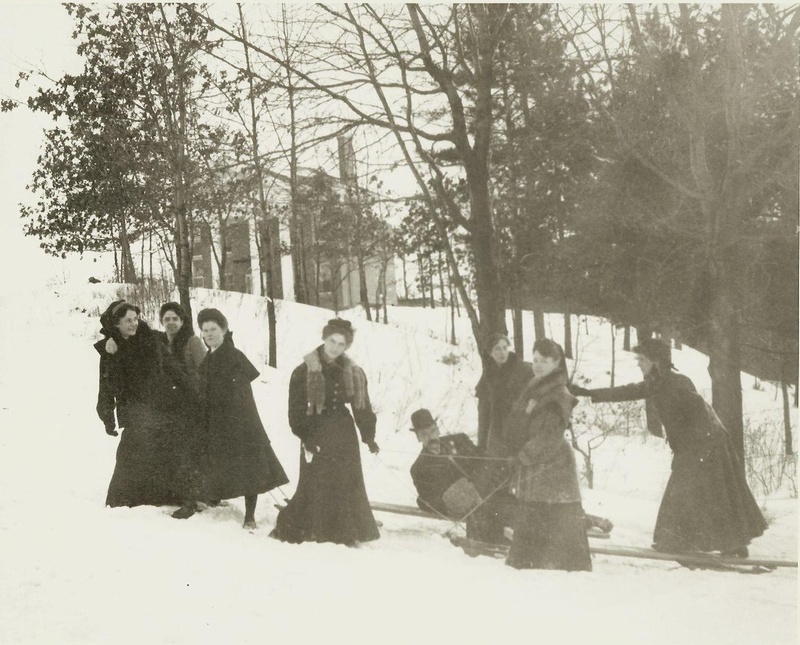 Mr. Hall, a portrait painter, is lying on a sled surrounded by his standing or pulling employees. Photographer unknown. Source Ethyl Johnson. 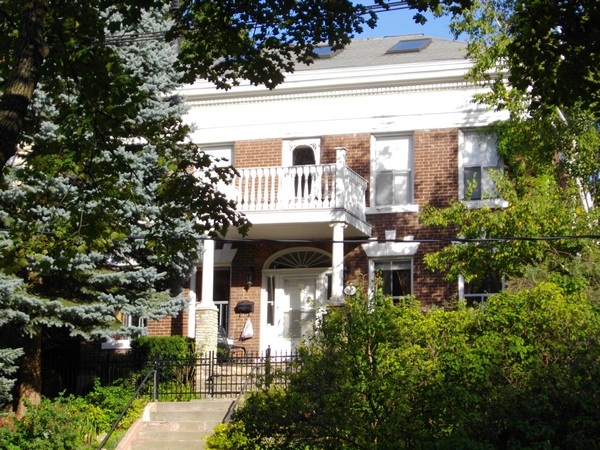 The original design of the house is of a grand colonial-style home, that can trace its architectural lineage to late 18th / early 19th century houses of early Toronto. The 2 storey height columns supportting an almost full width porch with a pedimented roof is unusual. The main body of the house is Georgian in style with a central entrance with fan glazing over the door and sidelights. The interesting arrangement of the voussoirs over the ground floor windows is original and is the only architectural decoration indulged in by the architect. Front door opens into a central hall and staircase with the principal rooms arranged to either side of the hall. The modern look of the house is with a more modest single storey porch and more typical appearance for a Georgian home. The second floor door onto the porch is original and from the archive photo it seems it opened onto a shallow balcony under the main porch roof. The orientation of the front towards the north-west, and away from the avenue of approach (Quebec Avenue) is unusual, suggesting the original land plot was of significant size, such that orientation could be free of the usual restrains of street frontage. The archive photo seems to suggest that the front lawn was more extensive and that the cutting through of Glendonwynne Road may have reduced that portion of the property to its present state.